The syndrome of heart failure is characterized by complex hemodynamic alterations with the hallmark being elevated filling pressures leading to symptoms of congestion. The pathophysiology of the interactions between heart and kidney is still insufficiently elucidated and in the setting of acute decompensated heart failure (ADHF), coexisting renal insufficiency often complicates the treatment course. Historically, poor forward flow, i.e. 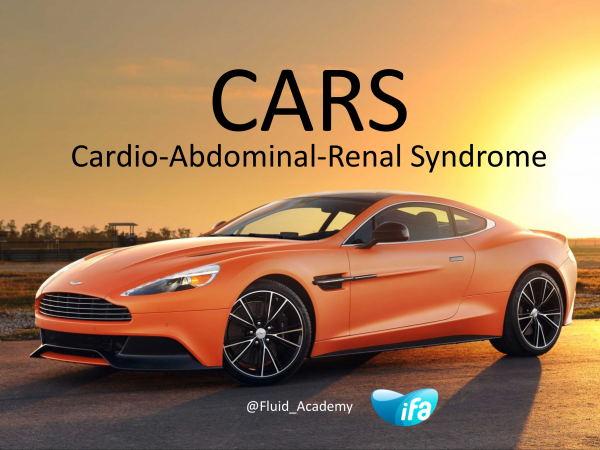 low cardiac output, has been considered the culprit mechanism of ADHF, but growing evidence has emphasized the importance of venous congestion, not only for the progression of heart failure, but also for the development of worsening renal function (WRF) during its treatment course. Because of low cardiac output (CO) and forward failure sympathetic ton eis incresaed with incresae in vasopressin (nonosmotic) and activation of renin-angiotensin-aldosteron system (RAAS). This will result in deminished renal perfusion pressure and hence sodium and water retention. Within this respect however it seems that central venous pressure (CVP) may be more important than CO. Therefore it is not only foward failure but the combination with backward failure and venous congestion that may explain WRF in ADFH. Venous congestion may result in increased renal venous pressure. Also because this often comes along with right heart failire and pulmonary hypertension. A potential role of the abdomen through coexisting elevated intra-abdominal pressure (IAP) has recently been proposed. Therefore, the traditional perception of WRF secondary to hypoperfusion of the kidneys through low-flow states has been challenged by the actual hemodynamics present, characterized by congestion and elevated IAP, leading to the concept of “Congestive Kidney Failure” or “Cardio-Abdomino-Renal Syndrome (CARS)”. This presentation of @manu_malbrain held at the 38th #ISICEM18 meeting in Brussels Belgium on March 20 will discuss the contemporary pathophysiological insights on the role of systemic venous congestion and elevated IAP in ADHF and its repercussions on the heart, kidneys and abdominal compartment. Current and future treatment strategies, aiming to relieve congestion while preserving renal function, will also be discussed.